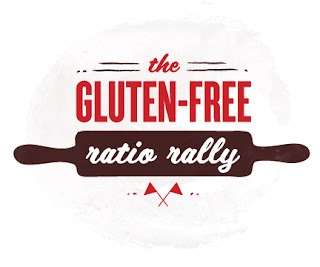 This month for the Gluten Free Ratio Rally, the theme is Fritters and Doughnuts! As I've mentioned in a few other posts this past month, work has been super crazy for me. That's one reason why I always look forward to the beginning of the month, is the great variety of awesome themed recipes. Fritters use a similar batter to pancakes, and are normally fried. For this recipe, I didn't have enough oil when making them, so I went with the lower-calorie approach of cooking them on a pan (giving them a similar appearance to pancakes). I served them with some pork ribs that I cooked in a pressure cooker, which I'll post the recipe to later Wednesday. Thank you to Meg for hosting the Ratio Rally this month! Her site is Gluten Free Boulangerie, which has a pretty awesome looking doughnut recipe. Dice the pepper and pancetta. In a small pan, cook the pancetta until it is crispy. Add the pepper to the pan, and cook for about 3-4 minutes, removing the items from the heat when cooked. In a large bowl, combine the flours, starches, spices, powder, and salt. To this whisk in the eggs and the milk. Once everything is whisked together, add in the peppers and pancetta. Heat a non-stick pan on medium heat. Pour the fritter batter by the quarter cup, and flip after about 2 minutes. Cook for another 2. I hope you enjoy, and be sure to check the rest of the Ratio Rally posts! Nice! A savory fritter is a great idea. These look so tasty. Great job on the doughnut/fritter challenge. I like your savory entry. Very interesting take on fritters!! And I love that you went a savory route - and perfect for late Summer! Savory fritters - I love them! These look delicious - great job! I never even thought of doing something savory! Thanks everyone! I definitely enjoyed coming up with a savory fritter. I haven't created something savory during other Ratio Rally events, so I figured this would be a fun opportunity to do so. And they most definitely were some of the tastiest fritters I've had. Also, I agree, pancetta is wonderful!